LibreOffice deployments are supported by certified developers and professionals (list available at: https://www.libreoffice.org/get-help/professional-support/). Many are employed by companies sitting in TDF’s Advisory Board (https://www.documentfoundation.org/governance/advisory-board/), who provide either value-added Long Term Supported versions of LibreOffice or consultancy services for development, migrations and training. LibreOffice is available in over 100 native languages, and as such is contributing to the preservation of native cultural heritages, as in the case – for instance – of the Guarani language in South America, and the Venitian language in Northern Italy. All localizations are managed by local volunteers. LibreOffice is also a reference implementation of the Open Document Format (ODF) ISO standard for office documents, which today represents the only choice in the market for true interoperability. LibreOffice’s leadership amongst office suites has been recently confirmed by the survey of Ubuntu users for desktop productivity software, with 85.52% of the votes. The closest competitors were Google Docs with 4.29%, WPS Office with 3.22% and Apache OpenOffice with 1.96%. 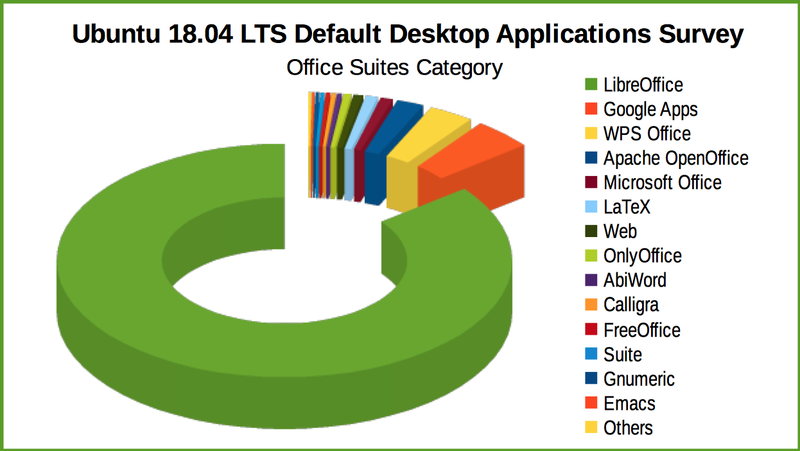 The Ubuntu 18.04 LTS Default Desktop Applications Survey produced over 15,000 responses in total, with over 6,400 for the office suite category. LibreOffice received the largest margin of preference of the entire survey. Results are available here: http://blog.dustinkirkland.com/2017/09/results-of-ubuntu-desktop-applications.html (video and slides). Current versions of LibreOffice are available for download from the following link: https://www.libreoffice.org/download/. LibreOffice users, free software advocates and community members can support The Document Foundation with a donation at https://www.libreoffice.org/donate/. Donations help TDF to maintain its infrastructure, share knowledge, and organise events such as the LibreOffice Conference, with the next one taking place in October in Rome (https://conference.libreoffice.org).